Give India’s children a happy New Year 2017! Adieu 2016, welcome 2017! The New Year is upon us – a time for new beginnings, forgetting past sorrows and imbibing the lessons learnt previously for a wiser tomorrow. It is also the time to count your blessings and be thankful for them. 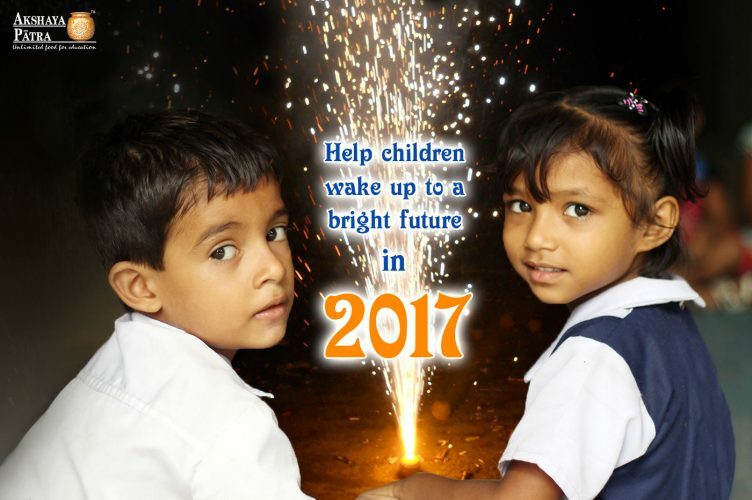 The dawn of New Year 2017 is a wonderful time to make a difference to the lives of India’s school children. Just as you have hopes and dreams for a brand new year, they too have New Year wishes. These primarily include wanting to study well, so that they fulfill their ambitions and secure their futures. Akshaya Patra strives hard to end classroom hunger and feed the dreams of young school kids across the nation. It gives wings to the hopes of children with its unlimited food for education initiative, by means of a wholesome, nutritious school lunch every day. This is what helps in drawing them to school day after day, every year. Currently, The Foundation feeds over 1.6 million children, across 11 states in India, expanding its footprint in India every successive year. Its New Year resolution is to bring many more children under its wings and feed 5 million children by 2020. The fight against classroom hunger is a collective one and it needs more soldiers to join it every year. If a future free from hunger and full of education can be envisioned, it can be achieved. 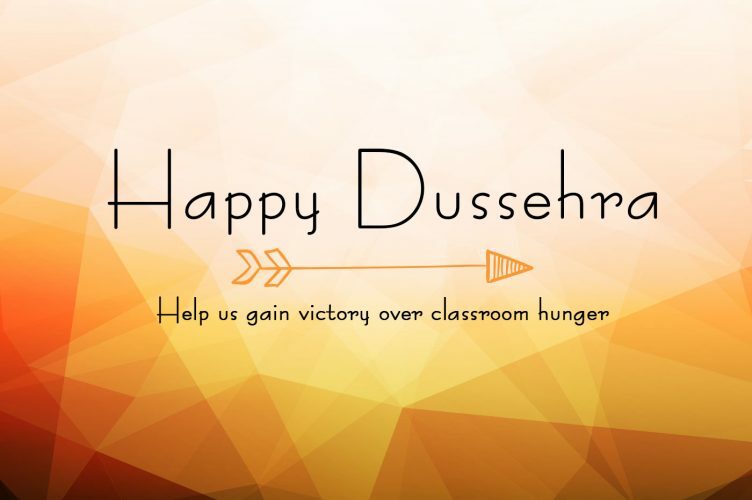 Why not resolve this year to join the cause of ‘food for education’ and put your best foot forward to ensure that India’s school kids are adequately nourished? Donate now to the cause! We also would also like to know the New Year resolutions you have made to do your bit for a hunger-free India. Tell us the same in the ‘comments’ section below. You can also leave New Year wishes for our beneficiaries! From everyone at The Akshaya Patra Foundation, we wish you a healthy, happy and prosperous New Year 2017! What is your Thanksgiving giveaway this year? The story goes like this. In 1620, a few pilgrims from Plymouth travelled in search of a place for resettlement. After they found a land, the Pilgrims began to settle down, but they had to survive a harsh winter. When spring arrived, they started farming with the help of a Native American, Squanto. Squanto taught the pilgrims how to cultivate corn, which proved successful in 1621. To celebrate this success, the pilgrims and the natives organised a feast which continues to be observed every year as a custom. The arrival of Thanksgiving is always a delight; organising a get together with family and friends, offering a prayer of thanks and celebrating the feast. More than how Thanksgiving is celebrated, it is the significance of the festival which means a lot to all of us. Harvesting (gathering of crops) is a global activity. Although Thanksgiving is celebrated majorly in the West, each country has its own harvest festival; Indian states celebrate harvest festivals during different times throughout the year. Regardless of where we come from, we thank the Planet Earth for producing grains and pulses that are the sources of our survival. In India, almost half of the population is directly or indirectly dependent on agriculture and the grains produced by a farmer feed thousands of people every day. A farmer to a businessman to a buyer, we are all encountering each other through one basic need – food. Keeping this tho ught in mind, Akshaya Patra launched its Mid-Day Meal Programme, which currently feeds millions of children every day with ingredients that are grown on land. Over 1.6 million school children feast on rice and sambar (in South India); roti and sabzi (in North India) that are freshly prepared in centralised and decentralised kitchens. The Foundation also runs food safety labs that evaluate the food ingredients from farm to plate. This year, let your Thanksgiving giveaway be something special for children. How about sponsoring a child’s meal for an entire year? Rs 950 is all it takes to feed a child for a year! 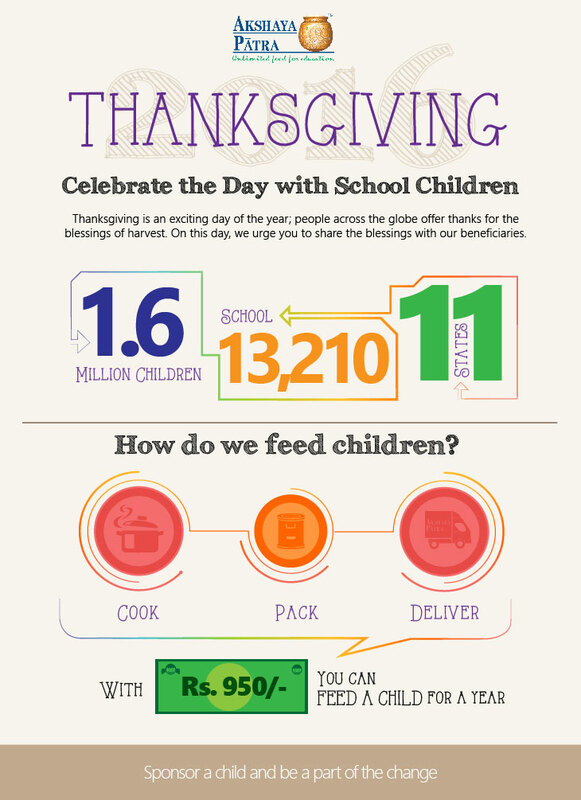 We urge you to share the blessings of Thanksgiving with Akshaya Patra beneficiaries. The organisation strives to guard children against hunger by providing mid-day meals in schools, thus encouraging them to attend school regularly. Our mission now is to reach 5 million children by 2020! We wish you a happy and a meaningful Thanksgiving! The festive season has gathered momentum and it is now time to celebrate the victory of good over evil on Dussehra. Also known as Vijayadashami, Dussehra commemorates the victory of Lord Ram over the ten-headed demon king Ravana and of Goddess Durga over the asura Mahishasura. An empty stomach is a menace that gnaws at the mind and eats away at its ability to focus. In school, children need a full stomach to be able to pay attention in class and excel in academics. Classroom hunger pangs reduce the ability to concentrate, affecting children’s academic performance. This results in lower scores, affecting the academic along with children, which hampers their long-term educational prospects. Classroom hunger also means skewed nutrition levels of children. A well-balanced diet is of paramount importance, especially during childhood, when the child is in his or her formative years. Lack of proper nutrition and balanced diet during childhood results in health problems and also has long-term effects on the physical, mental and psychological well-being of the kids. Classroom hunger often results in children dropping out of school to assist their families financially. Thus, young children are not only robbed of their childhood, but they are also burdened with responsibilities. A byproduct of this evil is that it encourages gender inequality, as young girls are forced to stay at home since their brothers are thought more deserving of an education. Worse still, they are married off to ease the financial strain on the family. Classroom hunger also frequently results in behavioural issues among children. These include constant irritability and volatile behaviour. Various studies prove that childhood hunger causes anxiety, depression, internalising behaviour and leads to them experiencing more stressful life events. Hunger is also known to lead to issues with self-control and problematic interpersonal skills. 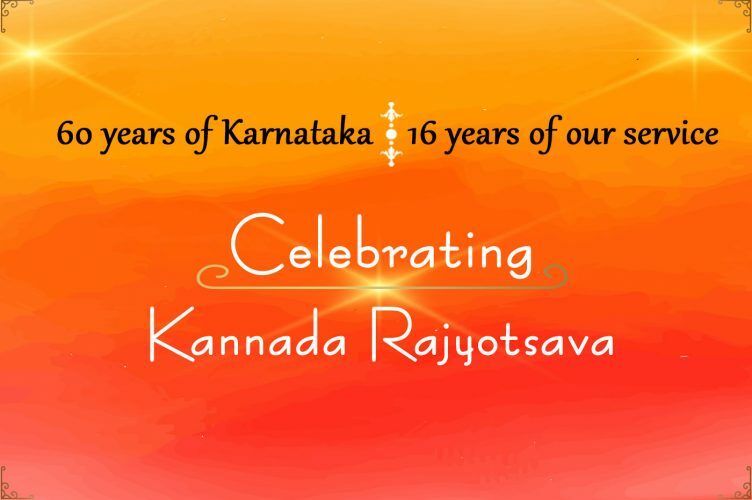 On this auspicious day, let us join hands and fight this evil together. Let us ensure that no child goes hungry; that he or she triumphs in life with good education. Festivals mean food. Family members, particularly mothers, labour all day concocting delicious sweetmeats and special treats for the occasion. Meddling in the kitchen as a child is routine, as the tempting aromas waft out. Once prepared, the family gathers to eat together and the spotlight is often on the young ones, as elders gear up to feed the children. Gorging on these delicacies, particularly sweets, without cares like diet-consciousness which creep into the adult psyche over time, is an incomparable feeling! Festivals are a time for family get-togethers and this means ganging up with cousins and having a blast with them! Playing all day long with siblings and cousins – be it catch-and-cook, hide-and-seek, hopscotch, or bursting crackers, the carefree revelries add to the magic of childhood. Running around while the elders are busy catching up and having their animated conversations adds to the festive cheer in the house! Who doesn’t like receiving gifts? We all do! But receiving gifts as a child is a very, very special affair. Be it that new toy that one coveted, a board game that one has wanted for long, the shiny new shoes or a gift of cash to add to the piggy bank, festival time begets all this! Covered in bright, sparkly gift-wrapping paper, these presents are remembered for a long time to come! Festival shopping is an eagerly-awaited event. Heading out with parents for buying brand new clothes is a blissful activity! Sifting through the new stock of clothes to choose what is best causes much distress, but once one finds the perfect frock or a t-shirt that is sure to be the new favourite, the mood turns bright indeed! Wearing these brand new clothes on the day of the festival and clicking a ton of pictures with family and friends cements the wonderful memories in time. One of the best things about festivals is that they bring in the holidays! 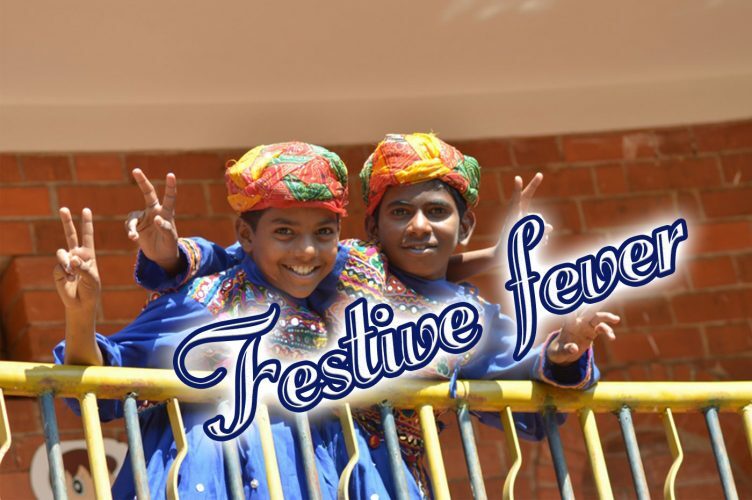 Whether it is a day’s holiday or a long one of two weeks, festivals mean a break from school. One can sleep for as long as one wants and watch all their favourite cartoons on television. Lazing around, playing games throughout the day, going on a family vacation for a few days – all this is permissible and doable during the festival holidays! A time for merriment, games, devotion and lots of sweet and savoury treats – festival time is one to make wonderful memories, sharing food and drink with loved ones and getting pampered as a child. You can do your bit to add festive cheer to the lives of children across India and help them feed one wholesome, nutritious meal a day to keep them in school. Donate now! Children embody all that is good and noble about mankind. For a nation to make significant strides, it is imperative that its children are well-educated and well-nourished. The Akshaya Patra Foundation, through its mid-day meal programme for school children, has ensured that millions of children across India are provided with healthy, wholesome mid-day meals, so that children do not drop out of school due to hunger. Recently, the Foundation, which feeds over 1.6 million children across 10 states in India in 13,210 schools, celebrated having served 2 billion meals since its inception, in the presence of Shri Pranab Mukherjee, Honourable President of India. They say the journey of a thousand miles begins with a single step. Akshaya Patra’s journey too had humble beginnings in the year 2000, when the organisation started serving mid-day meals to 1,500 children in five schools in Bengaluru. 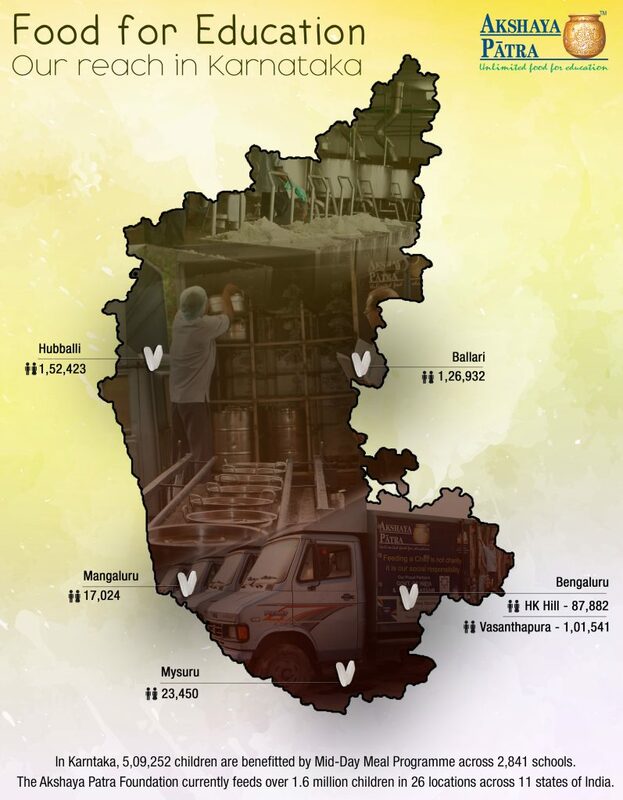 In the years since, the Foundation, in partnership with state and central governments and with the help of generous benefactors, established its presence across the country. It now provides nutritious mid-day meals, cooked in its centralised and decentralised kitchens under extremely hygienic conditions, to school children in 10 states in India – Karnataka, Gujarat, Rajasthan, Uttar Pradesh, Assam, Odisha, Tamil Nadu, Andhra Pradesh, Telangana and Chhattisgarh. Throughout the years, Akshaya Patra has shown much innovation and has been the topic of numerous case studies. Its state-of-the-art kitchens, many of which are ISO-certified, have also been covered as part of lengthy documentaries by the international media. The year 2012 was a very special one for Akshaya Patra, as it served its 1 billionth meal and was ranked 23rd among the top 100 NGOs in the world, by The Global Journal. In just four years since, the Foundation has reached yet another significant milestone of serving 2 billion meals. The organisation has its goal of feeding 5 million children by 2020 firmly in sight, as it pursues to expand its presence across the country. To view images of President of India commemorating 2 billion meals, click here. So where’s the party going to be? We simply love birthdays! There’s such an air of excitement – of the gifts you will receive, the heartfelt wishes that make your day, the big or small bash you’d share with your loved ones – each moment of the day is special. This year, we’d like to make a small suggestion to make your day a little extra special. Give a return gift to a child who is #HungryForSchool. There are millions of children in India who do not go to school, as they work to earn their daily meal. At Akshaya Patra, we give them a ticket out of this vicious cycle. We provide them with a hearty lunch at school. Does it work? There has been a spike of 28 per cent in enrolments this year, and it is directly attributed to the food we serve. So how much does it take to feed a child who is #HungryForSchool? Rs. 750 is enough to feed one child for a whole academic year. We ask you to make a small contribution on your big day, and make a huge difference to a child’s future. This year, have a blast, or have a quiet party, but share a slice of your joy with a child who is #HungryForSchool. Give him/her a return gift of Rs. 750.